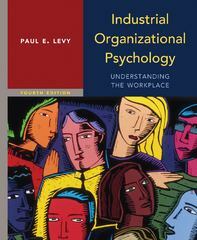 Industrial Organizational Psychology 4 Edition Written by a leading researcher in one of the nation’s top I/O programs, Paul Levy’s text has long been acclaimed for its concise, research-based approach. In the new edition, you will find an unparalleled balance of theory and practice. New “Taking It to the Field” exercises put students in the role of an I/O professional who must apply their knowledge from the chapter to advise their client. Long-time users of the book will still enjoy the author’s personable writing style, concise explanations of complex phenomena, and up-to-date perspective on the field.